Willis Calvin Crear was born on January 8, 1950 and joined the Armed Forces while in Birmingham, Alabama. He served as a 67A1F in the Army, Company C, 159th Aviation Battalion, 101 Airborne Division, and attained the rank of Specialist 4th Classs. Willis Calvin Crear is listed as Missing in Action. Orange County relatives find little consolation at graveside. would return alive from the Vietnam War. They hired psychics. They saw him in dreams standing in a rice field. They discussed the chance he got married and raised a family there. Other relatives grimly accepted the U.S. Army's official view that Crone, 21, was killed when a helicopter he was flying in exploded over Laos. 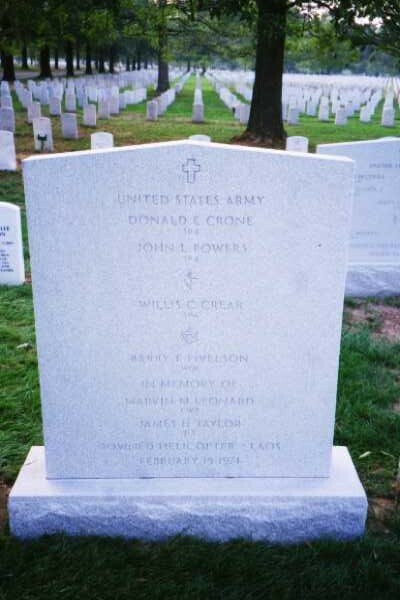 Accepting his death or not, a brother and three sisters from Orange County, California, stood beside a chilly grave at Arlington National Cemetery on Friday, watching as Crone was buried in a common crypt with three others who disappeared February 15, 1971. 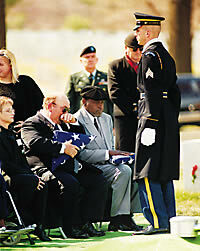 Thirty-one years after war had claimed Specialist 4 Donald Crone, he finally got a funeral. "The only reason I'm here ... is my brother volunteered. He was fighting for his country," Fullerton resident Arlene Teske said. "I'm here to honor my brother and his fellow crew members." Crone's Orange County family members shared one pew inside the Old Post Chapel, a colonial-style red-brick building, for the Protestant memorial service. With a reading from the 121st Psalm and the singing of Isaac Watts' classic hymn "O God, Our Help in Ages Past," the service brought a sense of finality to the lives of six men who never came home. A horse-drawn caisson led a procession from the chapel to the gravesite, followed by members of the U.S. Army Band and a platoon from the ceremonial "Old Guard" unit. A seven-member firing party shot three volleys into the air, then a bugler played Taps. Finally, a single, flag-draped casket bearing the "commingled remains" of Crone and three others - Warrant Officer Barry Fivelson and Specialist 4 Willis Crear and John Powers - was lowered into one grave. Family members said the casket is nearly empty. Crone's Army dress uniform and at least one other are in there, along with six, fingernail-sized bone fragments recovered two years ago from a field in rural Laos. "It's more symbolic than it is realism," said Crone's younger brother, David, 49, of La Habra. "(But) I think overall, it's probably a good thing. The government needs closure. It needs to put this to rest." Crone wasn't supposed to be aboard that ill-fated CH-47 Chinook flying fuel across the Vietnamese border to an outpost in Laos, relatives said. But when a friend got sick, he volunteered to fill in as crew chief. A fuel tank was loaded onto a sling beneath the twin-rotor helicopter. Somewhere over Laos' Xepon District, Army documents say, the Chinook strayed into enemy territory, then exploded, possibly from enemy fire, records state. Two sections of the helicopter flew in different directions. "Enemy activity in the area of the crash precluded a ground search," an Army report said. "However, an aerial search was launched a few minutes after the crash. ... No survivors were seen." The disappearance of Crone, a twin and the oldest of seven children from Whittier, hit his close-knit family hard, David Crone said. Clean-cut, fresh-faced and patriotic, Donald Crone enlisted right after high school and had gotten engaged to a local girl just before shipping out to Vietnam in July 1970. "It's been tough never knowing really the outcome," David Crone said. "My parents never accepted the fact that Donald was dead." demonstrations outside city halls, recruiter stations and congressional offices. Teske, Crone's sister from Fullerton, shared her parents' reluctance to accept his death. Friday's burial "might be the end of a chapter, but it's not the end of the book. They didn't bring Don home," Teske said. "That would be closure for me." The Army has spent 13 years searching for Crone's Chinook, one of hundreds of such missions since the war's end. The Army claims to have discovered the remains of 640 U.S. service members listed as unaccounted for. About 1,940 others are still missing. Three expeditions to southwest Laos from 1988 to 1994 failed to find any sign of Crone's crew, hampered in part by monsoons that apparently flooded a crash site, Army records and family members said. In 1996, however, searchers found a site strewn with bits of Plexiglas, metal, a Chinook data plate and the piece of a boot sole, records show. Army officials told family members that they had to send Laotian workers ahead to clear dense vegetation from search sites. One area had to be abandoned because it was infested with poisonous snakes, relatives said. Teams returning in 1998 and 1999 found a personal effect and data plates tied to Crone's mission, records show. Then, in early 2000, a joint U.S.-Laotian search team found a second crash - the spot where the helicopter's aft section fell, along with Crone, Crear, Powers and Fivelson. The second site, about two miles from the first, yielded human remains, crew-related artifacts and personal effects - including Crone's dog tags. In November, officials informed Crone's relatives that the Army's Central Identification Laboratory in Hawaii had tied the human remains to crew members in Crone's aft section, although it's unclear to whom or how. Family members say they were told the bone fragments were so badly burned, DNA testing couldn't be done. Since no remains were recovered from the site where the pilots were believed to have crashed, Taylor and Leonard remain missing, officials said. As far as the Crones are concerned, Donald Crone remains missing too. "I have very little faith that anything in that coffin belongs to my brother - other than that uniform that I put in there," David Crone said. Still, they were impressed at that "the Army's (providing) all the bells and whistles and full military honors 31 years later," Teske said. "It's kind of bizarre. I don't understand it," David Crone added. "But if I get a chance to honor my brother and get a little closure, I'll do it.